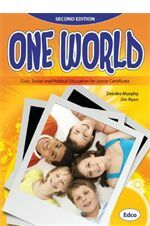 Revised and updated, One World is a single-volume CSPE text that covers the complete 3-year Junior Certificate course. New Free Workbook accompanies the text. Contains a section for the Action Project and enables students to keep a record of their work over the 3-year course. The online version of the textbook is available on , alongside a range of ICT resources designed to support the teaching of CSPE.